As a food lover, sometimes it’s hard to choose my favorite cuisine, but Romanian food definitely stands out. 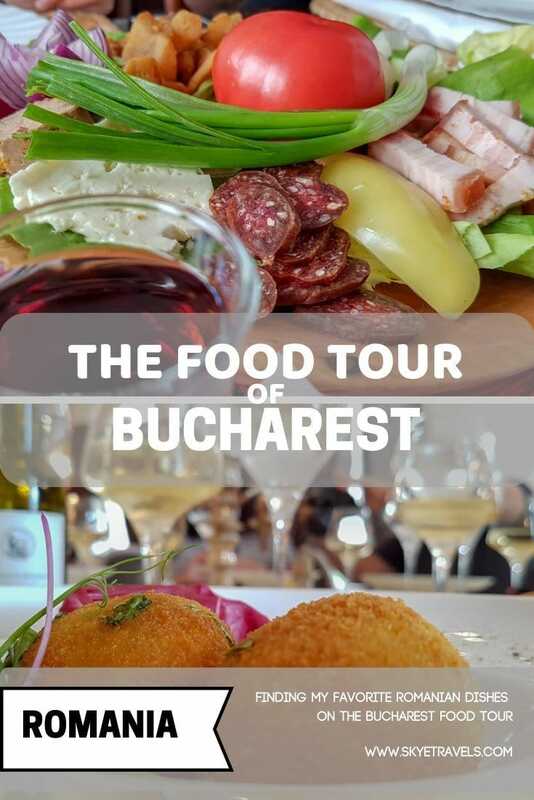 When I had a chance to take the Delish Experiences Bucharest Food Tour, I was excited and definitely not disappointed. Here are the restaurants we ate at and the delicious meals we were served. The first stop our guide Georgiana took us to on the tour was Vatra Restaurant. 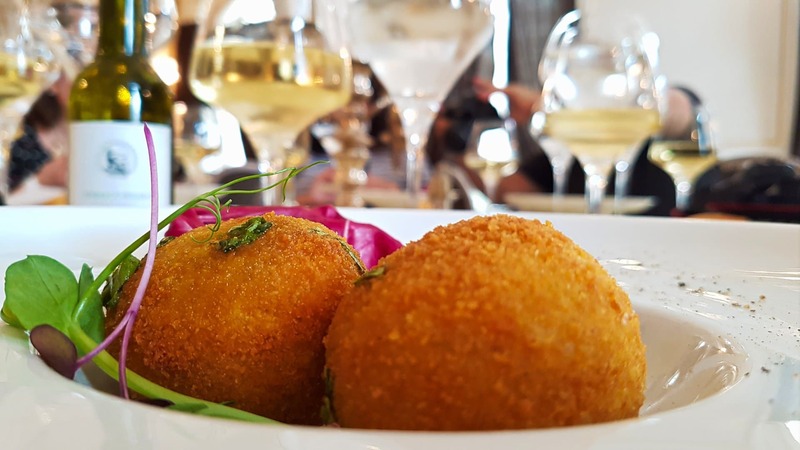 Located in a beautifully decorated building just two streets northwest of Bucharest’s Old Town, Vatra has been serving traditional Romanian cuisine since 2001. As we entered, we were warmly greeted as our table was prepared. In a country where good hospitality is a luxury, I immediately had a great opinion of the restaurant. Our meal started with ritual Țuică, a small glass of 40-45% plum liquor to “whet our appetite.” Sweet and strong, it got my salivating mouth even more ready for the meal. For our appetizer, Georgiana went to town. Instead of picking the best options, she went one step better. We got them all! Caviar spread, eggplant salad, white bean dip, zacusca (a roasted vegetable spread with eggplant, bell peppers, onions, tomatoes and carrots), and an assortment of local meats, cheeses and vegetables. I honestly have no idea which I loved more. Every one of them was amazing. If the tour ended there, I would have been satisfied. It didn’t. Before we had made it through all the appetizers, the main course arrived. 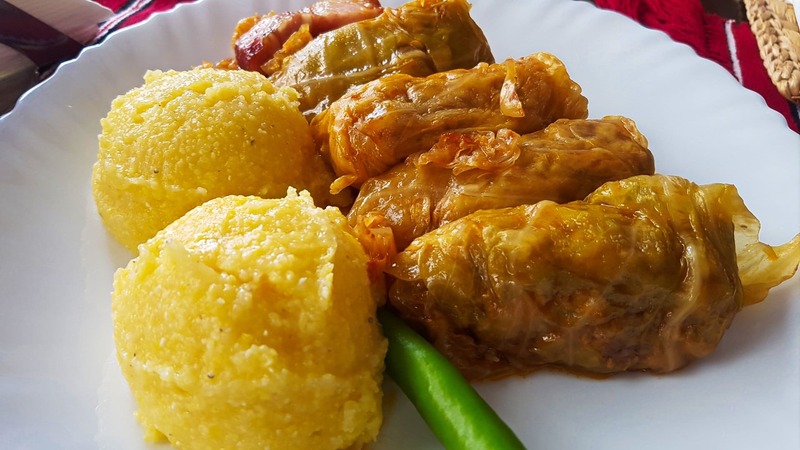 Sarmale (Romanian pork-stuffed cabbage rolls) and polenta. Even with six “foodies” gorging ourselves on the scrumptious dishes, there was plenty of food to go around for all of us. Yet by the end of the meal, we had scraped the plates clean. The second stop of the tour was at Concerto Fine Dining, the restaurant attached to the Grand Continental Hotel. Yeah, definitely dining at its finest! The menu might not be entirely budget-friendly, but it’s still a great price by Western standards, especially for the incredible dishes they serve. We started with a local demi-sec (medium-dry) champagne. 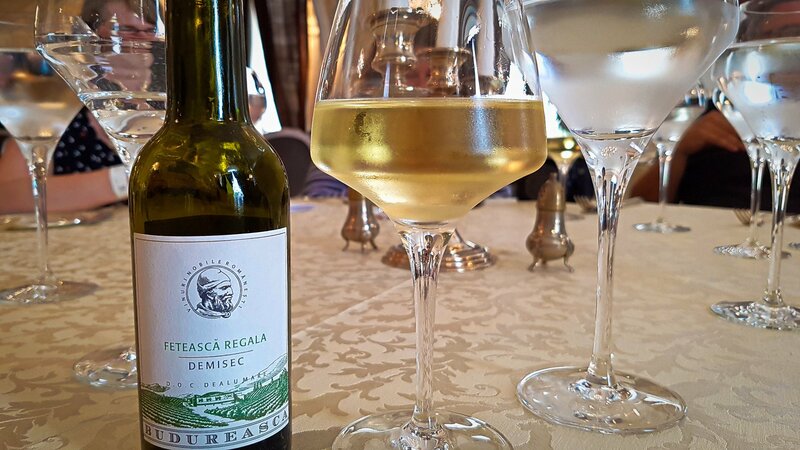 I had no idea that Romania is the six-highest wine-producing country in Europe and #14 in the world. Concerto prepared a special meal for us that wasn’t on their official menu. We were served momițe, a unique Romanian dish made from veal neck glands mixed with egg and then deep-fried. Talk about yummy! It wasn’t a lot of food, but we were all still full from Vatra. The final stop on the tour was Origo Cafe. I first discovered third-wave coffee at Brew Lab in Edinburgh. 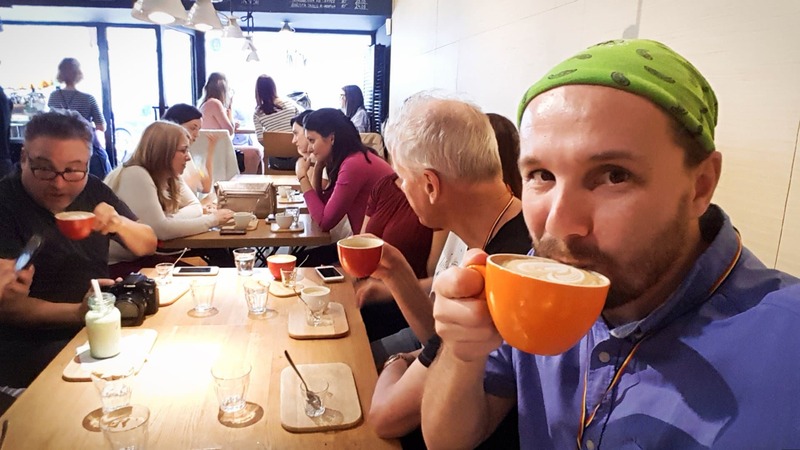 Single-origin roasts are a whole different level of coffee, and they’ve found their way to Bucharest. Origo takes them one step further. Not only is their coffee incredible, but they appeal to all five sensations of taste. They’ll also take the time to give you the full story behind third-wave coffee – something that Brew Lab was often too busy to do. Origo also offers barista and coffee classes every Tuesday and Wednesday. I went back for a latte more than once after the tour but they don’t allow laptops so it wasn’t the best location for work. Only socializing there. Someday I plan to take one of their classes when I’m back in Bucharest. The restaurants listed here were the three that we were brought to on our tour, but are not guaranteed for all tours. Georgiana does vary the tour as other restaurants are found. There are four different tours available. The first is beer and mici with the “On the Back Streets” tour. Both the “City Lights, History and Food” and “Hungry for History” tours include a meal at the 200-year-old, beautiful Hanul lui Manuc restaurant in the Old Town. Finally, you can customize your own bespoke tour with a Private Food Tour. Hours Available: Mon-Sun 9 a.m. to 7 p.m.
What to bring: Comfortable walking shoes and a big appetite. Appropriate clothing for the season. No mandatory dress for restaurants, but informal to semi-formal recommended. Best time of year to visit: Jan-Dec. As a good portion of this tour is outside, it’s better to book on a sunny day if possible.